February 11th, 2013 09:23 PM | by Pasha | Uncategorized. Patton gestured for me to move up behind the dog and prepare for the flush. There is something that triggers in the mind of a veteran quail hunter during the brief period between when the dog points and the birds flush. I instinctively looked the field over and from many, many past scenarios just like this one, through guess as much as experience, I deciphered the exact escape path the bird might take. He bounded from cover and gained altitude quickly by flying into the wind. He then banked downwind and into my load of #8 shot. Those ‘behind the point’ shots can be tricky. The safest way to turn 180 degrees is to draw the shotgun up close the body and keep it vertical, to avoid swinging the barrel past another hunter, and then, once in a safe position, pull the gun up to the shoulder to shoot. 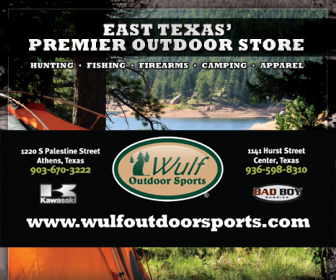 As a boy back in the sixties, I shot wild quail on some land owned by a family friend a few miles east of here. Today, I joined Patton who is exactly the same age as I, on the same land owned by his father, where he hunted quail close to a half-century ago. We were hunting just west of Hwy. 34, a few miles north of Terrell. A tradition was coming full circle and as we followed along behind Heisman, my mind kept backtracking to a different era, a time before cell phones and email, a time before instant communication with every other soul on the planet. After much thought and study, Patton decided to get his preserve hunting license and once again hunt quail on his place. “My goal was to keep the hunts affordable and provide a spot where hunters can show up in the morning, shoot a dozen birds and be back on the job by mid morning” says Patton. 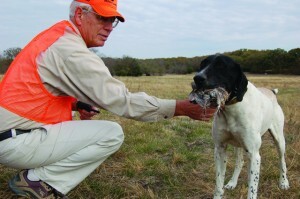 “We also provide great training grounds for young hunters to experience the thrill of walking up behind a staunch pointer or setter, experience the flush and hopefully bag a few quail for the skillet, all under safe, controlled conditions.” Patton also offers two fields on his Poetry Shooting Club for hunters to work with their pointers and setters. “With the lack of wild birds today, many hunters no longer keep their own bird dogs but it’s surprising at the number of quail hunters that still have dogs,” says Patton. “We have two fields that are perfect for working and training dogs. We keep a good stock of flight conditioned quail on hand and guys can purchase at a reasonable price, as many birds as they wish to release for their dogs to hunt. These controlled conditions are ideal for exposing young dogs to birds or taking the ‘edge’ off veteran bird dogs. We also have several ponds that are designed for retriever training.” Patton says several of his hunters this season vowed to again purchase pointing breeds and with a convenient place to work them, get back into quail hunting. After wrapping up a morning quail hunt with my newfound friend Walter, I felt very good about his new operation and desire to provide affordable quail shooting. Quail hunting might not be as easy for today’s youngsters to become involved in as it was back several decades ago, but thanks to guys like Walter that have devoted their time and land to keeping the tradition alive, it’s still possible to experience the awesome thrill of walking up behind a quivering bird dog with flared nostrils that, with body language that leaves little room for doubt, is telling you “The birds are here, boss… RIGHT HERE! To learn more about the Poetry Shooting Club, go online to www.poetryshootingclub.com or call 214 728 2755. SIDEBAR- DUTCH KETTLE QUAIL > Quail are, in my opinion, one of the tastiest of game birds. My good friend, outdoors writer Bob Hood, taught me a method of preparing them in a Dutch Kettle that is absolutely awesome. Of course, they can be baked in the oven as well as over coals. Begin by melting a stick of unsalted butter in the Dutch Kettle. Next, take 2 rows of Ritz Crackers and using a can, roll them into a fine meal. Coat the quail with the Ritz meal and place them into the kettle. Place the remaining Ritz cracker meal on top. Dust with a little salt and pepper. Place coals under and on top of the Dutch Kettle (or place in oven set at 300 degrees) for about 45 minutes and check for doneness. Serve with your favorite green vegetable. This makes for a great ending to an exciting quail hunt!